An Epic Day: Epic Casual Dining provides a perfect aftermath to a special occasion. It doesn’t happen often enough, but when the planets are aligned just so, and your mojo is meshing marvelously, you have a perfect day'the kind of day that makes you almost believe that there really is someone pulling the strings from up on high. I had a day like that recently, and it’ll stick with me forever. It was epic. My perfect day began with a “family blending” ceremony on a beautiful meadow beside a pond in Millcreek Canyon. We’d enlisted Rev. Tom Goldsmith from Salt Lake’s First Unitarian Church to help our kids (hers and mine) understand and celebrate the “new” family that is created when divorced parents remarry. Rev. Tom’s wisdom, wit and wonderful countenance won the day. If you’re ever contemplating a first, second or even third marriage, I recommend without reservation having Tom Goldsmith at the helm. After our morning ceremony, we spent the afternoon with the kids strolling through the gorgeous gardens at Thanksgiving Point and in awestruck wonderment at the North American Museum of Ancient Life there. Kids love dinosaurs, and Thanksgiving Point’s Museum of Ancient Life has dem old bones in spades. I’m also looking forward to returning to Thanksgiving Point and trying out the Harvest Restaurant there: The menu looks promising indeed. But for our perfect day, we wanted to dine at a place that was a bit more kid-friendly. And that’s how we wound up at Epic Casual Dining in Midvale. 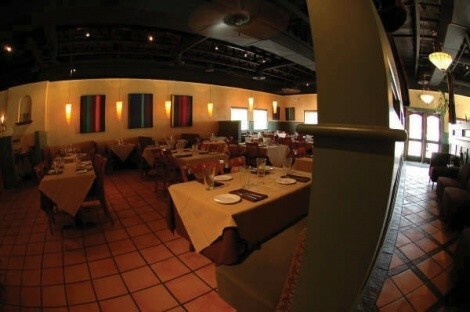 Epic Casual Dining is located in the space of the former La Terraza. That restaurant was pretty enough, but Epic has kicked up the décor a notch with lots of classy soft olive hews, beautiful booths and such; there’s nothing very casual looking about Epic. It’s a restaurant that, by all appearances, looks like it’s going to be hard on the pocketbook. It ain’t. I suppose every perfect day must have its glitch or two. Ours began after we were swiftly seated at a large table near the rear of the restaurant. We were promptly given menus and a wine list and then … abandoned. As the minutes ticked away with no sign of any server to feed our table of hungry and thirsty kids, I began to understand the “casual” part of Epic. Spotting a gaggle of servers chatting near the kitchen, I approached and asked if any of them would be willing to wait on us. As it turned out, there was a staffing mix-up that day and our server didn’t know he’d been assigned to our table. Apologies were accepted'no harm, no foul. Service at Epic from that point on was outstanding. An order of flatbread ($2) with a mound of hummus was quickly delivered, and caused me to try and remember the last time I’d seen a $2 appetizer in a restaurant. I couldn’t. The crispy flatbread is cooked in the restaurant’s wood-fired brick oven and arrives at the table warm with fragrant herbs and shreds of Asiago. The same flatbread, but without the hummus, comes alongside the steamed clams ($8) with its rich, heady broth, and is the perfect weapon for soaking up every last drop of that luscious liquid. When you can get a 6-year-old to chow on clams, hummus and flatbread, you know it’s good. Naturally, the boys all opted for the individual pizzas ($5) from the kids’ menu. I stole a slice from my son Hank, and sort of wished I could’ve ordered from the children’s selections myself'that is, until my plate of tender pork tenderloin medallions ($15) arrived. The thin slices of pounded pork are first seared with kosher salt and cracked black pepper. Then the pan is deglazed with sherry after which caramelized onions, fresh sage and veal stock are added and reduced with a bit of butter. My, oh my, that pork was pleasing! I’d have eaten every marvelous morsel solo, but Hank kept purloining pork portions from my plate. “It’s yummy!” was Hank’s economical review. I couldn’t have chosen any better words to describe Epic’s perfect pork. Throughout dinner, we were treated to a set of songs by singer-guitarist Ryan Miller; Epic has live music on Tuesday, Wednesday, and Thursday nights. Handling requests for songs like “The House at Pooh Corner” and “Vincent” with aplomb, and even doing a jazzed-up instrumental version of the Super Mario Bros. theme, young Miller so impressed Hank that he asked for an autograph'his first celebrity script! Ryan has a gorgeous voice, just the sort of thing to enhance an already perfect day. I plan to hire him for my next wedding (just kidding, gorgeous). I did note one Epic oddity, however. Water is served in large white wine glasses. Nice touch. For some reason though, white wine--in our case, a bottle of delectable Albarino--was served in even larger red wine glasses. Strange--although not really a problem, since I typically prefer the biggest glass in the restaurant for my wine, red or white. I hope you soon have a day as perfect as the one I recently enjoyed. Or, at the very least, I hope yours is epic.